About - You Should Visit Japan! About me and my website. 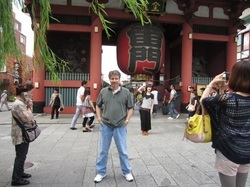 I first became interested in Japan back in the 80's, when both the American and Japanese economies were growing, and Japan made the best cars, motorcycles, guitars, cameras and watches for the money. I wondered about the people who could make such good products, especially so soon after rebuilding from a major war. Who were they? What were they like? What was their culture like? The more I learned, the more interested I became. Experiencing Japan first-hand has been the most amazing thing I've ever done (and I've done a lot of cool things!). To give you an idea, every single one of the pictures that appear on this website were taken during my trips to Japan. Often, I meet people who say "I would LOVE to visit Japan! But..."
But it takes a lot of flying to get there. But they don't know the language. But they don't know anybody there. I was like that for years. Intimidated by the distance and expense. Intimidated by the difficult language. Shy about trying to speak what little Japanese I knew to native speakers. Finally, frustrated by missed opportunities, I took the plunge and stayed with friends I made through a job contact. I don't regret it a bit. And neither will you. My hope is that my little non-profit website will make it easier for you to make your own Japan dream come true. If it does, be sure to let me know!